Think you can’t afford a POP display? Think again! At Midwest Graphics, our in-house design team talks to companies daily about the best ways to package and display their products in retail. While the client may be thinking about using POP (point of purchase) displays to showcase and sell the product, they may be reluctant because of budgetary concerns. They just don’t feel the numbers add up to warrant the expense associated with the POP. From our experience, the question the client should really be asking themselves is whether their avoidance of using POP displays are causing them to lose sales and, if so, how much? Marketing statistics show POP’s have been proven to dramatically boost product sales. An average boost is in the range of 20%! And, POP displays don’t have to cost an arm and a leg. POP costs can be controlled in a variety of ways. Ordering the displays well in advance and in bulk can help. 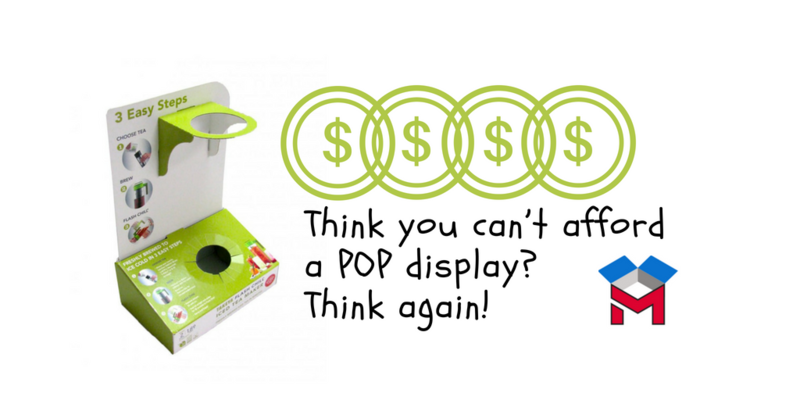 Also, the costs of the material used in the POP display varies greatly, offering options for tight budgets. Choose from wood, metal, or cardboard. And, the quantity of POP’s ordered affects overall costs, with the per-unit price dropping as the quantity manufactured rises. At Midwest Graphics, we have many years of experience in designing POPs. Our design team can accurately estimate your expense and take the guesswork out of the decision-making process. In the final analysis, it’s all about placing your product within your customer’s view and letting the POP help sell it for you. Any POP is going to be cheaper than placing ads on television! And, POP’s help in selling the product in that critical first 4 seconds of viewing. That’s the time most buyers take in deciding whether to pick up your product or pass it by! At Midwest Graphics, our design team will help you design a POP display within your budget. Then, watch your product get the attention it deserves and watch your brand grow! Previous PostOur eight tips for designing a great package!Next PostWho doesn’t LOVE digital printing? DIGITAL PRINTING – Opening a World of Customized Options in Packaging. DIGITAL PRINTING – offering a low-cost alternative for attractive and flexible packaging design. Www.Talkhelper.Com on Digital Printing – the BFF of any small business! Josh on UV coating – adding that touch of class to any printing!